Spirit calls itself "the unbundling leader in the industry," offering low base fares and charging fees for anything extra. (CNN) -- The extensive menu of airline fees is growing again -- at least at one low-cost carrier. Florida-based Spirit Airlines has announced it will charge a $5 fee for passengers who ask an agent to print their boarding pass at the airport. The new policy applies to all domestic and international flights booked on or after Tuesday for travel on November 1, 2011, and beyond. 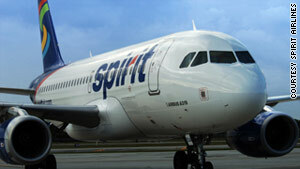 At the same time, Spirit says it is lowering fares on all nonstop flights by $5 each way. It's the first U.S. carrier to charge a boarding pass fee. In Europe, Irish-based low-cost airline Ryanair has a similar, though more expensive, policy. Spirit is just listening to its customers, it said. In a survey, most told the carrier that they preferred lower fares in exchange for checking in online. "We want to give [passengers] the ability to choose the extras they want without forcing them to pay for add-ons they don't want or need," Ben Baldanza, the president and CEO of Spirit, said in a statement. "By lowering the fare for everyone and then charging only those who choose for us to print their boarding pass, we let the customer decide. It's all about consumer choice." Spirit is used to being in the news for its fees and advertising campaigns. Last year, the airline became the first carrier in the United States to implement a fee for carry-ons. In March, it added fees for travelers who wait to pay for carry-on or checked luggage within 24 hours of departure. Spirit proudly calls itself "the unbundling leader in the industry," offering low base fares and charging fees for any extra service. It's also an aggressive marketer and often stirs controversy with its flight promotions, such as the recent "Weiner Sale" during the sexting scandal involving former Congressman Anthony Weiner.